Cyrsti's Condo: A Quiet Week? So far, after a fairly busy week last week, this week is shaping up to be pretty mellow, and normally it means really struggling to find what I consider to be quality blog materials. In fact, when I talked to the transgender woman novice the other day, she said she was thinking of starting her own blog. I told her cool, but don't get hooked. Some days words come so easy and some days they don't come at all. Writing about going out to the cross dresser, transgender social and another non related social event Liz and I went to Saturday help of course. Plus, while we are on the subject of blogs, if you have a non spammed blog you want to trade links with, just let me know. If you remember the post here in Cyrsti's Condo that I had to delete after I wrote a welcome post when all of the sudden my anti virus software went nuts, that's why I say "non spam." To kind of fill the gap, and post a few pictures, I found a few I haven't posted in awhile, deep in the dark recesses of my computer. Of course the one I really wanted to find, I haven't. I believe it to be the oldest picture I have...if I can find it. The picture today is from my first trip to the beauty salon approximately four years ago. I am amazed how much my hair has grown! 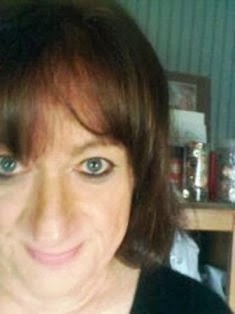 At the time, I had just decided to come out to my daughter as trans (who is very accepting) and the salon visit was a gift. A regular blog can develop an insatiable appetite all of it's own, it can take over your life as it develops a life of it's very own, and the tiny income from a few ads really does not compensate for the time spent ~ we must be mad! Yes, Madness has been considered...Lol! I don't have your number!